The Bedford Public Library uses geothermal heat pumps to cool and heat the building. We had completed extensive energy efficiency improvements to the library and needed to replace an old, inefficient, oil-powered HVAC system. The town had appropriated funds to replace the library’s boiler and cooling tower and to design and install a new heat pump system. The engineers provided options for the replacement system, including installing a newer version of the oil-fired system and changing to a geothermal system. The rate of return (ROI) analysis performed by the engineering firm indicated that a geothermal HVAC system design for the library would have the most favorable ROI (12 years) and be the least invasive to the building. 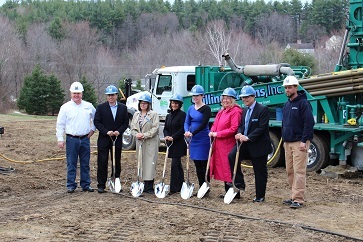 The project was funded through the combined financial support of the Governor and Executive Council’s award of a NH Public Utilities Commission Renewable Energy Fund grant and an Energy Efficiency Services Rebate from Eversource Energy, in combination with Town funds. This funding combination made it possible to install a state of the art closed loop geothermal thermal system at the Library. A touch screen monitor highlighting the project is on view for the public to learn about our geothermal system.